Americlock has lengthy experience working on historical clock restorations featuring clocks that range from decades to centuries old. Many of these can be found in renown institutions, buildings, and churches around the United States but some have even found homes in sports stadiums. Site of America’s first scoreboard back in 1895, the University of Pennsylvania’s Franklin Field finds its roots back in 1895 when it was constructed for the Penn Relays, the nation’s oldest track and field competition. 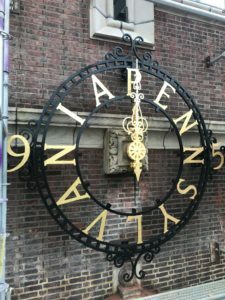 While the original stadium has long since been replaced by a completely new structure in 1922 followed by several generations of upgrades, the approximately 100-year-old clock remained. Built from wrought iron, the landmark clock featured hands made from brass sheet and was in dire need of professional restoration. 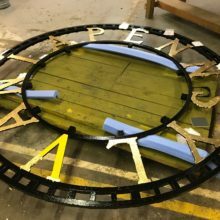 The University of Pennsylvania contracted Americlock to undertake the task and the clock was removed in one piece before being transported by to Americlock’s facilities in St. Louis to undergo a restoration process. Given the material used to fabricate the hands, the clock hands had to be braised back together. 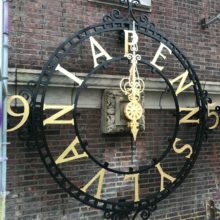 The clock itself was media blasted back to metal and all traces of black tar (used as a finishing layer at one point) were removed. 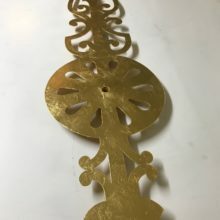 In the cleanup process, Americlock’s team determined that even though the hands were painted white, they had originally been coated in gold leaf. 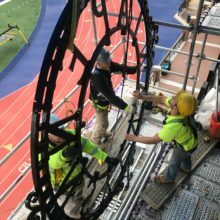 Not wanting to miss an opportunity to restore such an amazing timepiece back to its former glory, Americlock advised the university directors and a decision was made to keep the skeleton clock historically accurate. Using a 23.75kt Rosenoble gold leaf, Americlock hand-applied the gold leaf on the numbers and hands, not unlike the process that was originally used decades ago. 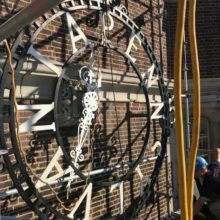 Americlock’s expert team also fabricated and welded new stainless-steel brackets to hold the clock off the wall since the original brackets were corroded beyond repair. The brackets were sent ahead of time for brick masons from Knapp Masonry to install ahead of time. 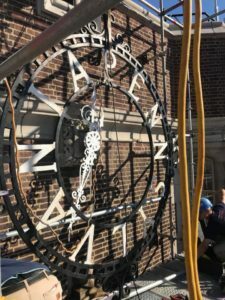 On a rainy Monday morning the historical clock was lifted back into place and bolted back to the wall that it had graced for a century. 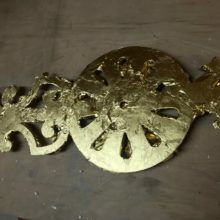 Great care was taken to ensure that the new gold leaf was not touched in transport or installation. By 3:00 PM that afternoon, the new motor and controller were in place, providing the clock with the correct time. 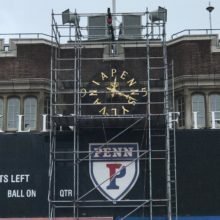 Next time you’re in Philadelphia at Franklin Field, take a moment to appreciate this incredible timepiece that once again bears witness to a century of athletic triumphs. Thousands of spectators, athletics, support staff, and visitors have passed by it well before the digital age and can now continue to do so for years to come.